A corporate website is unlike your other run-of-the-mill websites. It must be able to project credibility and should also be aligned with the purpose, aim and objectives of the corporate entity that it represents. More importantly, a corporate organization usually targets a global audience and the website in turn must be able to match the needs of this audience. Here are 10 design tips that can guarantee an online presence worthy of a corporate. When it comes to corporate website design, it all begins here. With the amount of data that might be exchanged across the website and that needs to be made available to the visitor, a simple HTML based website is not enough. You need to use an easy to use and update CMS that can handle all the data with efficiency. The first objective of website design must be to deliver the corporate message with clarity. The use of straightforward images and uncluttered visuals is perfect for this purpose. Any cluttering of the design or overwhelming the website visitor with a huge amount of visuals will affect the clarity of the website message. A corporate website, mission statement must be clear, which gives website visitors a definite idea about the website’s purpose. One of the first things that a corporate website visitor looks for is the mission statement, so make sure that they can see it clearly. Put it up on a sidebar at the top of the landing page, illustrate it clearly in the content or place it in the header – whatever you do, the statement must come out strongly. 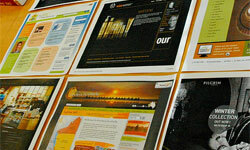 The schematics of your website must be similar to the marketing collaterals used for promoting the organization. So, not only should the logo be similar to the ones used on the promotional materialsbut so should the design elements. Remember, the website is a part of any corporate’s branding efforts, and should be recognized and leveraged as such. This is only in case the corporate still doesn’t have a logo. The logo must be a perfect visual representation of all that the corporate stands for. More importantly, it must be able to fit in seamlessly with the general design of the website. All corporates need to be friendly with the media/press, so ensure that there is something like a media center in the website. The job of the media center is to make available to the press and media, all materials that will help them get a better idea of the organization. The media center can have media kits that can be easily downloaded, or logos, press releases and anything and everything that can further the image of the corporate. Nothing beats having a blog, when it comes to building a personal interaction with website visitors/customers/target audience. A corporate can further improve its reputation, if it’s seen as making a concerted effort to reach out to customers with its blog. The blog can offer more information about the services or products offered by the corporate, but not from a marketing point of view. The information must be such that it must enable potential customers to make an informed decision regarding the products and services on the site. Deploy social media buttons on the site to enable content sharing across social networks such as Facebook, Twitter and Google plus. But, ensure that that the buttons are placed in an inconspicuous position on the site so that they don’t hinder the overall design of the website. The idea is to make the website more engaging and bring in more traffic. Design element like blinking images, scrolling text, animations and sound can distract your visitors. Avoid using them in a corporate website, which doesn’t need such elements in the first place. Stick to the purpose of the site and nothing else. Your corporate website doesn’t need flashy multimedia. It will just ruin the credibility of your website. No corporate website visitor likes flash multimedia playing on the website, when all he wants is information. Flashy graphics will only serve to shift the focus away from the site’s professional outlook. These tips have been given randomly so don’t go looking for a common thread running through these tips. 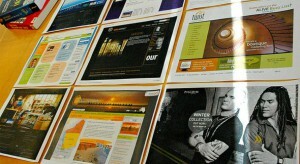 These are just some of the many tips that need to be considered for designing a corporate website. At the end of the day, successful corporate design is entirely dependent on the sense of professionalism conveyed by the website’s design. Philip Donald has years of experience in various domains like Web Designing, Development, Project Management, Internet Marketing and more. He is currently working with PLAVEB, which is a leading iPhone App Development and Web Design Company located in Los Angeles, California.